Explore one of the most important historical sites in China, boasting of a magnificent architectural complex steeped in culture and the arts! The Palace Museum, better known as the Forbidden City, holds a vast collection of paintings, calligraphy, ceramics, and antiquities from the many golden periods in China’s imperial history. 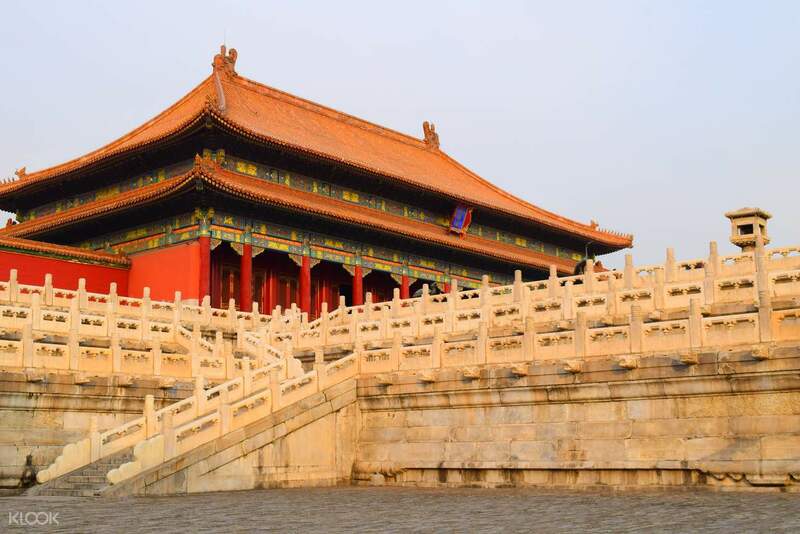 Located at the heart of Beijing, you’ll be excited to see that the Palace Museum houses not just historic spots, spectacular gardens, museums and theaters, but also contemporary cafes, restaurants and shopping malls. Subway stations and bus stops are within walking distance, making it very accessible especially to first timers in Beijing! Meet up with your professional guide and enter through the Meridian Gate, a massive U-shaped portal at the south end of the complex, which in former times was reserved for the use of the emperor. Since yellow is the symbol of the royal family, it is the dominant color wherever you look. Roofs are built with yellow glazed tiles; decorations in the palace are painted yellow; even the bricks on the ground are made yellow by a special process. Your guide will help you find your way through the Forbidden City and put everything you see and hear into perspective. It was a very cold n windy winter's when we visited the Forbidden City. Our guide Sandy was really great, very concerned for our welfare n the cold as we are from tropical Singapore. Sandy speaks English very well and was very knowledgeable with the history for the Forbidden City. Overall, it was a great tour and I highly recommand it! It was a very cold n windy winter's when we visited the Forbidden City. Our guide Sandy was really great, very concerned for our welfare n the cold as we are from tropical Singapore. Sandy speaks English very well and was very knowledgeable with the history for the Forbidden City. Overall, it was a great tour and I highly recommand it! Very good tour lead by guide,his name is “Happy”! Very clear information given throughout. We look forward to book another trip soon. Very good tour lead by guide,his name is “Happy”! Very clear information given throughout. We look forward to book another trip soon. Good communication with the tour guide Leo through WeChat before meeting with him. Leo is nice and helpful. Recommend to use WeChat for communication. The Forbidden City is crowded everywhere, yet a memorable experience. The actual visit time was just around 2.5 hours, so a bit rush. Good communication with the tour guide Leo through WeChat before meeting with him. Leo is nice and helpful. Recommend to use WeChat for communication. The Forbidden City is crowded everywhere, yet a memorable experience. The actual visit time was just around 2.5 hours, so a bit rush. Alice was very friendly taking us through the forbidden city. We had some very good discussions about the history and significance of the place. Highly recommend taking this tour. Alice was very friendly taking us through the forbidden city. We had some very good discussions about the history and significance of the place. Highly recommend taking this tour. Tour guide’s voice is too soft. Even the activity is only 3 hrs but she still willing to tell us more. Overall is good. Tour guide’s voice is too soft. Even the activity is only 3 hrs but she still willing to tell us more. Overall is good. The Tour guide Leo was very nice and professional. A very unforgettable experience and my family enjoyed the tour a lot. The Tour guide Leo was very nice and professional. A very unforgettable experience and my family enjoyed the tour a lot. Kai is very knowledgeable, introducing us forbidden city. He was very patient with the kids and suggested the palace museum shop to shelter the harsh weather. The shop sell very nice souvenirs compared to other attractions. The tour is 3h, you may wish to stay in the palace after the tour. highly recommend for family with young children. Kai is very knowledgeable, introducing us forbidden city. He was very patient with the kids and suggested the palace museum shop to shelter the harsh weather. The shop sell very nice souvenirs compared to other attractions. The tour is 3h, you may wish to stay in the palace after the tour. highly recommend for family with young children. Initially, we had some difficulties to locate our tour guide as many of the roads nearby the TianAnMen were blocked. The tour guide was generally helpful. Initially, we had some difficulties to locate our tour guide as many of the roads nearby the TianAnMen were blocked. The tour guide was generally helpful.